For Your Computer / Server / Router etc. This Product is Discontinued and Superseded by the NEW RPS IV unit. The RPS III-2 is a call-activated “power control” switch. 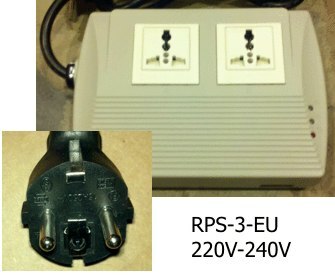 Available in 120V US or 220V European (Product Code: RPS III-EU2 for 220V) versions. This feature rich power controller enables you to power up, power down, or reboot power to your equipment ( up to 15 Amps) through a single phone line. 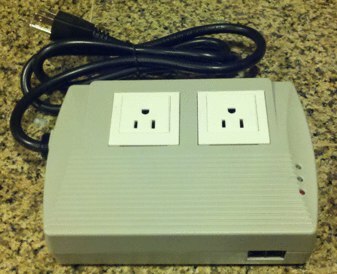 The device uses voice prompts for easy user control of the power functions of the unit. Access from anywhere using your telephone. 2 Electrical Ports on the unit allow for individual power on/off control. 110-120V US, 15 Amps Maximum for all ports, with a 8 Amp individual port limit. Maximum Power Output is 650 Watts Incandescent, 1950 Watts General Purpose. Secure Password Access by DTMF touch tones. Operating Temperature Range: 32°F ~ 120°F, For Indoor Use Only. Provides real time status of the power setting of each of the ports by voice guidance. NOT COMPATIBLE WITH ANSWERING MACHINES. This RPS device uses voice prompts for easy user control of its features. The prompts will interfere with your answering machine operation as it talks to you upon answering the phone. If you need a remote power switch device that will work with most answering machines, please review our RPS II remote power switch. Dimensions 7.25″ Length x 5.25″ Wide x 1.75″ Thickness. If you are looking for an single port DTMF controlled Answering Machine Compatible out-of-band solution to your remote power control needs, have a look at our Telephone Remote Power Control Device,the RPS II Remote Power Switch. If you are seeking a Web/ IP Remote Power Switch, see our RPS-ERP-2 Unit. If you need a remote power control device that combines web and telephone reboot into one unit, please see our RPS-SPL4 4 Port RPS Device.